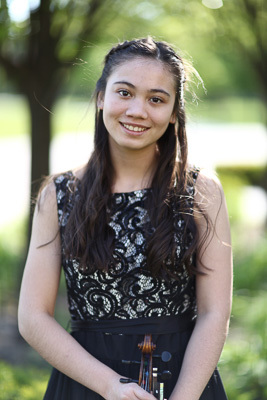 Rachel Aina Call, age 15, is a full scholarship student at the Gifted Music School and the recipient of the Dorothy Richard Starling Foundation Scholarship under the direction of Eugene Watanabe. Rachel was a semi-finalist at the Blount-Slawson Instrumental Competition and an honorable mention finalist of the Coeur d’Alene Symphony Young Artist Competition this year. She competed in the quarter-finals at the 43rd and 44th Annual Fischoff Competitions in 2016 and 2017. She performed in the Finalist Concert of the Stradivarius International Violin Competition Utah Division in 2016 and was announced first place winner of the Junior Division. In 2015, Rachel performed at Carnegie Hall as a winner of the International American Protégé Competition. She played at the Utah Symphony’s Youth Guild Recital each year since 2013. She advanced as a finalist in the Salute to Youth competition in 2015 and 2017 and performed in the winner’s concert with the Utah Symphony. Rachel has performed with the Utah Symphony, Utah Philharmonic Orchestra, American Fork Symphony, Timpanogos Symphony, and Utah Valley Symphony. Over the years, Rachel has played in Master classes and/or Coaching sessions with Andrés Cárdenes, Midori Goto, Sel Kardan, Yoheved Kaplinsky, Arnold Steinhardt, Roberto Diaz, and Baiba Skride. Rachel is a Sophomore at Timpview High School.